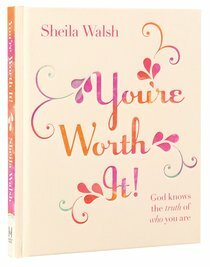 In this beautiful book, bestselling author Sheila Walsh shares how you can experience the wonder of feeling and being worthy. With understanding and wisdom, she leads you to God's Word and encourages you to receive His unending grace. When you do, that restlessness you've carried for so long falls away, and a new spirit of fulfillment takes its place. You can let go of the fear, shame, doubt, and sense that your life is less than ordinary. And you can experience the freedom found in God's outrageous love and mercy. In His embrace you are worth it! Go the distance and let Sheila help you uncover the beautiful truths through which you--a daughter of the King--can regain your peace.